Editor’s note: In Salih Seçkin Sevinç, creator of the fantastic Turkish-language food blog Harbi Yiyorum (roughly translated as “Eating, For Real” in English), we’ve found a kindred spirit and a source for great eating tips. 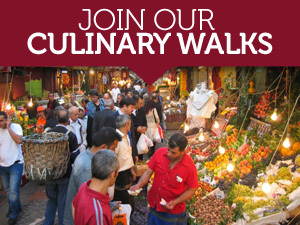 We’ve asked Salih to share with our readers some of his culinary wisdom this week. 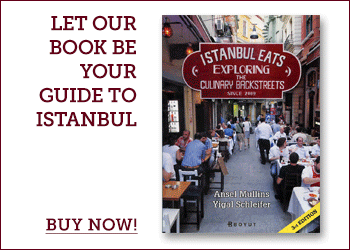 This is his third post about the mind-blowing food scene in Southeast Turkey’s Gaziantep. 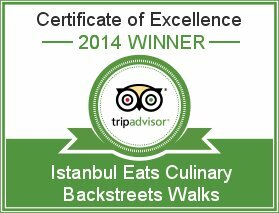 Our plane arrived at 9:30 in the morning at Gaziantep Airport and one hour later we were already at kebab and baklava emporium İmam Çağdaş – the first place in the city that comes to mind for eating – for breakfast. İmam Çağdaş was founded in 1887. Today, it is run by the grandson of İmam Dede: Burhan Çağdaş. They also send orders “outside,” by which I mean overseas. One of their famous clients is the Turkish president, Abdullah Gül. When we arrived, the place was empty. We settled at a table next to the window. The waiter approached. We said, “Selamün aleyküm. We are coming from Istanbul. Writing articles on eating and drinking. We will eat and drink. Also take some pictures. Did we arrive a little bit early, today?” “What do you think?” he replied, sarcastically. Despite the early hour, we ordered an eggplant kebab and an ayran to go along with it. Following the waiter’s suggestion, we also ordered an Antep-style lahmacun to start off. Of course, we were advised about the restaurant’s baklava before coming here, so we ordered that as a dessert. In Antep, lahmacun is prepared with minced garlic that’s sprinkled on top. Mashed grilled eggplant is served on the side to spread on it. You apply the mashed eggplant on lahmacun and you eat it that way. We never tried lahmacun like that before, but it tasted weirdly nice. Actually, that lahmacun was the best lahmacun we’ve ever tried. The dough was not too crispy and not too soft, the minced meat that topped it delicious. After we squirted some lemon on this beautiful lahmacun, we were informed that in Antep a lahmacun eaten with eggplant and lemon is called “söğürtme.” We should note that we tried lahmacun in several different places during our visit, but folks, lahmacun should be eaten at İmam Çağdaş. But now it’s time to sing the praises of the baklava that we ate at İmam Çağdaş. There are so many baklava makers in Gaziantep, but we never tasted anything as good as what we ate at İmam Çağdaş. It’s a totally different experience. I asked the owner how to eat his baklava? He said, “Leave the fork and the knife and grab the baklava between your two fingers. Turn it upside-down. Push it towards the roof of your mouth and now bite.” I did as he said. Oh, God! Wish I never had bitten that thing. The miraculous crackling sound that was made as I bit down on all those thin, flaky layers went straight to my brain. My approach to baklava will never be the same again. Yes, that one bite completely changed me till death. Sorry guys, but besides their famous baklava didn’t u taste the available that day other sweet varieties, and I mean fistikli ezmesi? Those green little “sausages” that flavor the whole of your breathing airways with the unique aromas of the fistik filling? Is it true that their sweet products are organic ones? best meat of my life: it is the “kushleme” i ate in “kepapci mustafa usta restaurant” at the back of zeugma mosaic museum. the meat was like turkish delight. the best “doner” of my life: “ustabaşı doner salonu restaurant”, you should turn right on way to sanliurfa, when you see the gaziantep graveyard. the best dessert of my life: it is not baklava for me. it is “sarma kadayif” which is a kadayif that has kaymak-creme and pistachios in it, i ate in “tashkent kadayif ” opposite of gaziantep high school. Great tips Oguz! Can’t wait to try them out next visit. I’d like to start by telling anyone who reads this how beautiful turkey is. Istanbul has been the most fabulous city of all. I’ve travelled a bit. 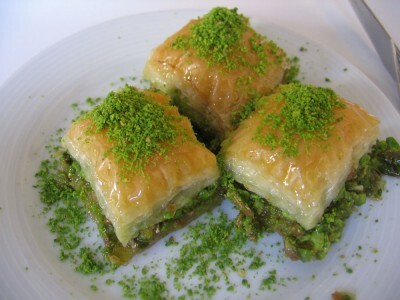 My dear cousin has introduced me to what I must say the most delicious baklava I’ve ever had, they go by the name SINI. He told me they come from Antep every morning. I have tried several times to find if there is any trader who actually delivers these like the traders do in istanbul. The difference is that istanbul baklava’s are nowhere as nice as those from Antep and if anyone can please suggest me a place to contact for an few orders to london and dubai perhaps I’d really appreciate it. Utmost respect for the bakers. In the early 60’s, I lived in Trabzon for a couple of years. My friends and I enjoyed going downtown and visiting the various restaurants and coffee shops. In a tiny coffee shop on a side street is where I was introduced to baklava and strong Turkish coffee. I have been a fan ever since. But here in the states, it is not easy to find good ethnic foods unless you live in or near a big city. A Greek restaurant in my Indiana town, has baklava and other sweets shipped in from Chicago, but they are not the same. My fondest memories are the friendly people and the excellent food. Now if I could only find a good Turkish eatery in Indiana.